I’ve been wishing for this for years. Not everyone with a “Walkman” is listening to music. Some of us listen to lectures. Now it’s even better. Complete course lectures from some of the best schools, Yale, Stanford, MIT, in high quality video. Biology, physics, engineering, law, history, economics, medicine, you name it. And the collection is constantly growing. About one percent of the U.S. population suffers from a sensitivity to peanuts. Accordingly, foods are labeled to warn if any peanut products are contained. Even packages of roasted peanuts that are labeled “PEANUTS” in giant letters, also include a list of ingredients showing peanuts, plus a warning that says, “Warning: Contains Peanuts”, as though a package labeled PEANUTS might not contain peanuts. About the same percentage of the U.S. population, about one percent, suffers from a gluten sensitivity that sickens and causes physical damage to the digestive system, yet there is no requirement for food labels to show a warning for gluten or ingredients that contain gluten. Why? A few specialty food makers produce gluten-free products and label them as such but most mainstream food makers do not. Wal-Mart’s Great Value brand does label gluten-free products, which is great, but products without the gluten-free label are a guessing game. They might or might not contain gluten. Kraft Foods has promised to label anything containing gluten by including “wheat” in the ingredients list. That’s very nice of them still does not provide much comfort since nobody is under government mandate to label foods properly like they are when it comes to peanuts. Gluten is normally associated with wheat but it’s not that simple. That’s why proper labeling is very important when it comes to gluten. Gluten can appear in foods in unexpected ways. Flavorings such as caramel, stabilizers and thickeners used in ice cream, ketchup, salad dressings, and many other ingredients can contain gluten depending on how they are made. There’s no way for the customer to know. And just because one bottle of A1 Steak Sauce does not make you sick does not mean the next bottle won’t because the source of caramel in the product might change from a gluten-free source to one that contains gluten. Nothing on the label will change to show the difference. There’s no way for the customer to know unless the maker is required to specifically put gluten or “wheat” on the label. I don’t know why this is not done–why the FDA does not require gluten warnings on foods. What Does this Label Lead You to Believe? 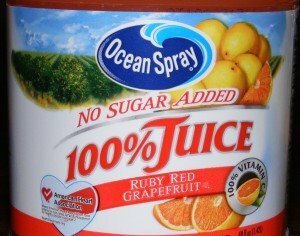 “Ocean Spray 100% Juice” means what, exactly? Ruby Red Grapefruit, 100 percent juice, no sugar added. And the price is higher than an equivalent amount of refrigerated fresh 100 percent orange juice, so it must be pure grapefruit juice right? Wrong. It does not say “pure grapefruit juice” and it’s not. If one reads the ingredients one learns that it contains grapefruit juice plus two other juices. Talk about deceptive labeling. I hope you are reading the labels in the “juice” section of the market. The only pure juices one can find these days are certain grape juices and most prune juices. All others, like 95 percent of the “juices”, are blends and “cocktails”, and are also spiked with high fructose corn syrup to help you get fat faster. Why? If I wanted soda pop or candy I can go to the soda pop or candy sections of the market. This is supposed to be the juice section, or it used to be anyway. Be very careful when buying fruit juices. “Pomegranate juice” is mostly grape juice. “Blueberry” is mostly grape juice. Read the label and you’ll find that nearly all of them except grape and prune are not what they appear to be.